ETA: Bentley Publishers also has a TSB that explains this here, which Jef posted way back in 2014. Last edited by Uwe; 02-23-2017 at 09:48 AM. You can find this chart here. However unless Joe-average is an enthusiast, he/she generally has less financial justification when choosing which multi-meter to buy. But this notwithstanding, Joe-average generally has the same unshakable degree of confidence in the reading shown on the meter screen and on lots (most?) domestic multi-meters this confidence is misplaced . The particular issue when "domestic" multi-meters are used for parasitic leakage analysis is that the test numbers are usually very small and this exacerbates the meter inaccuracy issue (which is further complicated by the noisy electrical environment in which the test is performed). 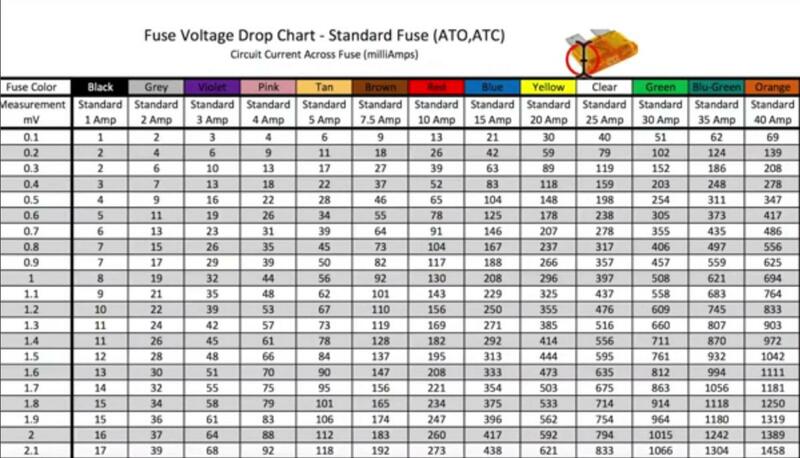 This reading inaccuracy (@ small volt-drop numbers) makes the current draw number from the reference table in the video somewhat fungible (in my bitter experience)! So, if I may interpose a further point of complication to an otherwise excellent video - certainly do all the multi-meter tests shown in the video as a precursor to measuring the volt-drop across the fuse, but consider also that multi-meters sometimes tell deliberate lies (it's not their fault)! Even if your preliminary multi-meter tests are successful - just because the meter screen says 3 milli-volts, doesn't mean that the volt-drop is actually 3 milli-volts! Last edited by DV52; 02-22-2017 at 06:41 PM. - just because the meter screen says 3 milli-volts, doesn't mean that the volt-drop is actually 3 milli-volts! Don, I could not agree more. Can't tell you how many times in my career a technician working with me gave me a reading number just because the meter said so... And then when I shorted the leads together - where the meter should read 0volts - I showed that the meter had an inaccuracy. Bad leads can change your numbers guys. Bad meters can change your numbers. Your meter itself should be checked regularly if you are going to do millivolt measurements. Voltage drop tests can be a help but be skeptical of results... Learn your gear and know what it can/cannot do for you. Practice doing voltage drop tests on known good systems before you have the confidence that on a screwed up system, the measurement you take is the Gold standard of measurements. It likely is not! Oh, and one more thing - the shorter the leads to the meter - the more likely the measurement will be accurate. Uwe, do you have any objections to slipping that under your video? This technique is all very well but not all fuses have the connectors exposed for external measurement with a meter. If you look at the video, most of the small fuses at the top don't have the external contacts although there are some pink ones that do. Certainly, in my A8, ALL the small fuses on both sides of the dash don't have the contacts for measurement. If one does run into this issue, then I think the correct solution would be to buy new fuses with test ports. Fuses are pretty cheap. The ones without test fuses are still good, toss them into an empty Altoids tin for later use.